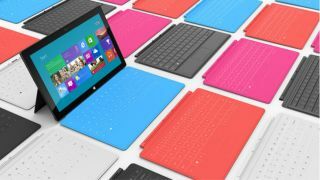 The Microsoft Surface tablet will go on sale from John Lewis on Friday, the retailer has confirmed. The Windows RT device had only been sold through Microsoft's official store since its launch in late October, but this week the device opened up for sale through third-party retailers in the US and Australia. High street chain John Lewis is the first store in the UK to earn that privilege, with online sales beginning on December 14 and in-store offerings commencing the next day. Its presence in stores will represent the first time UK-based tech fans will be able to play with the device without actually buying it, as Microsoft has no brick and mortar retail stores in Blighty. The company told Pocket-Lint: "Always first with the latest technology, John Lewis is delighted to announce that it will be the first high street retailer in the UK to offer the Microsoft Surface from the 14 December." The 32GB tablet, with the neat Keyboard attachment will cost £479, while the larger 64GB model and keyboard will set you back £559. John Lewis is also offering a two-year guarantee on each tablet at no extra cost. Tidy.